When bones are discovered – often by somebody walking their dog - law enforcement authorities need to know whether to devote considerable resources to looking for more human remains, and possibly starting a homicide investigation, or whether to de-escalate enquiries because the remains are from butchered food animals. Bones may be presented to a forensic pathologist, or anthropologist, with the request that they determine whether they are human or not, and there has been a gap in the market for a good-quality text to assist them in this endeavour. 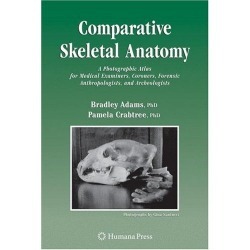 'Comparative Skeletal Anatomy' goes some way to filling this gap, but doesn't quite fill it completely.